Folk Artist & Decorative Painter. I moved to Vermont after having lived in many big cities in the midwest, south and southwest. 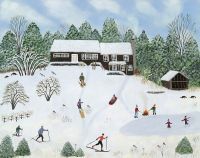 Inspired by the quaint villages, beautiful countryside and breathtaking mountains of Vermont, I started painting traditional folk art scenes. My work grew to include painted furniture, murals, grain painting and faux finishes on furniture, boxes and other decorative objects. My work has been shown in Vermont at the Weston Craft Show,Weston; Peru Fair, Peru; Camelot Village, Bennington; John McLeod, Ltd., Wilmington; Mountainside Photo, Stratton; Gallery 103, Chester and Artist's Guild of Manchester. and of course at my own shop located at 1379 Reilly Road, Londonderry. I am a member of the Vermont Art Council . I have an Associate of Arts degree from the University of Florida and a Bachelor of Arts in Art from the University of Texas at Austin. I am also a retired attorney, have been a volunteer EMT and a Hospice volunteer. I am happily married to my husband, Bud, have 2 children, 3 grandchildren, 3 step-daughters and 5 step-grandchildren. 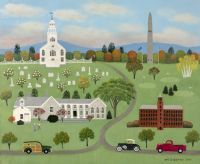 Martha's Folk Art could not survive without the love, help and support I receive from my husband, Bud. He does the "grunt" work, such as sanding, basecoating, lugging stuff around, all of the framing, and pitches in whenever I need help. Thanks, honey. Vinegar graining is accomplished by applying a mixture (glaze) of vinegar and dry pigments or vinegar and watercolor paint to a base-coated surface and using different tools and materials to make a rich texture in the vinegar mixture.